ERIC BOLLING: A new report claims that American fears of Muslims is driven by a small but well-funded network of Muslim haters. And who is behind this new report? Bill Clinton's former chief of staff who still has ties to the Obama administration, that's Mr. Podesta. 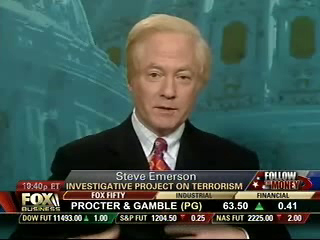 Joining me now is Steve Emerson of the Investigative Project on Terrorism, one of the groups blasted by the new report. Steve, what is going on here? Break it down for us, sir. STEVE EMERSON, INVESTIGATIVE PROJECT ON TERRORISM: First of all, I sort of feel somewhat complimented because they are attributing to me and four other people the ability to control the minds of 300 million Americans for 15 years. Look, the reality is, and bottom line is, the cause of any suspicion toward Muslims is because 65 to 70 percent to all international terrorist attacks are carried out by radical Muslims. So there is a fear based on that. If these people were concerned about the security of this country, genuinely concerned about moderate Islam, they would not quote terrorist organizations -- they quote a front group for Hamas. They would not claim that I'm behind this hysteria but they would look at the rampant anti-Americanism, anti-extremism, anti-Christianity that promotes the airwaves in Muslim world and even in the United States. BOLLING: Let's go back to this report. This report was released by the Center for American Progress, is that right? EMERSON: Yes. And that is a $38 million a year organization that looks like Democratic Party in exile. BOLLING: Who are they funded by? EMERSON: Well, they don't release the names of their funders, interestingly enough, but we know at least George Soros, Peter Lewis, and the Sandlers from San Francisco. BOLLING: Tell us, I am going to call it the Soros supported Center for American Progress, who do they blame for Islamophobia now? EMERSON: The blame me, Daniel Pipes, David Horowitz. There are five people that are considered responsible. What is interesting here is that when it comes to looking at Islamic terrorist attacks, what they deny, and what they claim is racist, is the assertion that Islamic terrorism is motivated by Islamic extremist clerics, mosques, statements, videos. EMERSON: They -- this reminds me of the Protocols of the Elders of Zion, or it reminds me of somebody who would attack the Southern Poverty Law Center because they attacked the Ku Klux Klan, right? I'm the messenger. BOLLING: My point is what is causing the 19 radical Islamists to hijack airplanes and fly them into buildings in New York and D.C.? Where is it coming from? EMERSON: I can assure you, I had nothing to do with it. That's number one. Number two, they believe that the only reason there exists suspicion against Islam, popular suspicion, and it is not a majority, it's a minority, is because of people like me who are orchestrating it like "the Wizard of Oz." The bottom line is it comes from so many rampant sources, if you go on YouTube and Internet most of the Islamic organizations in the United States, they are run by the Muslim Brotherhood or created in the Muslim Brotherhood, a group that believes in imposing Islam and Sharia in the world. BOLLING: We need to leave it there but I find it hard to believe that a group of four or five people who are responsible for what is perceived Islamo-phobia. I think it has to do more with 3,000 people dying at World Trade Center 10 years ago. Steve we are going to have to leave it there. Thank you.